Citizen scientists have discovered five tightly packed planets outside our solar system, nearly 620 light years from Earth, using data from NASA's Kepler Space Telescope. The alien worlds, all orbiting a Sun-like star located within the constellation Aquarius, are considered super- Earths, sizing in at two to three times larger than our own planet, researchers at Massachusetts Institute of Technology (MIT) in the US said. All five exoplanets are likely scorching hot. Each planet comes incredibly close to its star, streaking around in just 13 days at most - a whirlwind of an orbit compared with Earth's 365-day year, they said. The planets also appear to orbit their star in concentric circles, forming a tightly packed planetary system, unlike our own elliptical, far-flung solar system. The size of each planet's orbit appears to be a ratio of the other orbits, suggesting that all five planets originally formed together in a smooth, rotating disc, and over eons migrated closer in towards their star. The researchers, including those at The California Institute of Technology in the US, say the credit for this planetary discovery goes mainly to the citizen scientists - about 10,000 from the around the world. They pored through publicly available data from K2, a follow-on to NASA's Kepler Space Telescope mission, which since 2009 has observed the sky for signs of Earth-like planets orbiting Sun-like stars. The team used a popular citizen-scientist platform called Zooniverse to create its own project, dubbed Exoplanet Explorers. 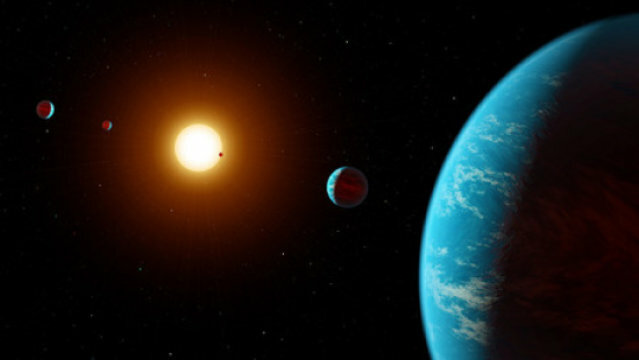 The project was inspired by a similar effort via Zooniverse called Planet Hunters, which has enabled users to sift through and classify both Kepler and K2 data. For the Exoplanet Explorers project, researchers first ran a signal-detection algorithm to identify potential transit signals in the K2 data, then made those signals available on the Zooniverse platform. They designed a training programme to first teach users what to look for in determining whether a signal is a planetary transit. Users could then sift through actual light curves from the K2 mission and click "yes" or "no," depending on whether they thought the curve looked like a transit. At least 10 users would have to look at a potential signal, and 90 per cent of these users would have to vote "yes," for researchers to consider the signal for further analysis. "We put all this data online and said to the public, 'Help us find some planets,'" said Ian Crossfield, assistant professor of physics at MIT. "It is exciting, because we are getting the public excited about science, and it is really leveraging the power of the human cloud," Crossfield said.